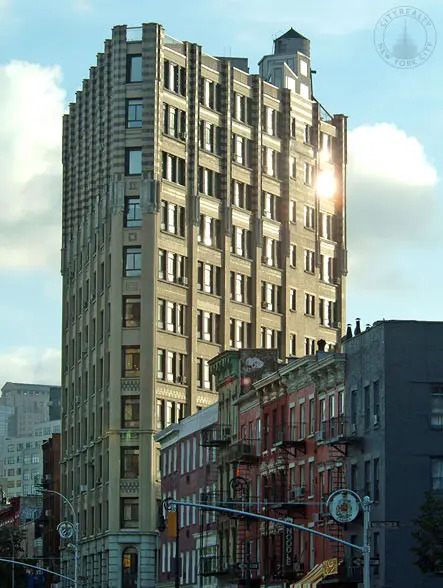 This turreted, wedge-shaped tower is one of Greenwich Village's few high-rise landmarks and the subject of a famous painting by John Sloan, the Ash-Can School painter. Robert and Roger Fisher were the sponsors of the building's condominium conversion in 1982. The 12-story building is in the right foreground of "The City From Greenwich Village," one of the most important paintings ever done of New York City and now in the collection of the National Gallery of Art. As Sloan described it, "Looking south over lower Sixth Avenue from the roof of my Washington Place studio, on a winter evening. The distant lights of the great office buildings downtown are seen in the gathering darkness. The triangular loft building on the right had contained my studio for three years before. Although painted from memory it seem thoroughly convincing in its handling of light and space…The picture makes a record of the beauty of the older city which is giving way to the chopped-out towers of modern New York." Painted in 1922, the painting shows a luminescent downtown skyline in the distance with the Woolworth and Singer Buildings prominent and the rooftop water tanks and bustle of low-rise buildings of the Village bisected by the elevated on the avenue. The building, which has a narrow, one-window-wide, north façade, is across the now elevated-less avenue from the asphalt basketball court that has been the site of legendary make-up games for decades and it is also just up the avenue from the Waverly movie theater, one of the few remaining in the Village. With its large windows and minimal décor, the building's architecture is very strong and distinctive because of its wedge-shape.